Published: April 7, 2014 at 05:25 p.m. 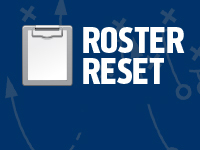 Updated: April 10, 2014 at 02:08 p.m.
Around The League's Roster Reset series kicked off Sunday with an overview of free agency in the AFC West. While the Denver Broncos continue to pull away from the pack, their secondary takes a backseat to the Oakland Raiders' defensive line for most improved position group. In addition to re-signing stout run-plugger Pat Sims, the Raiders imported 159 combined sacks in the trio of veteran pass rushers Justin Tuck, LaMarr Woodley and Antonio Smith. On the heels of two disappointing, injury-riddled seasons, Tuck was a terror down the stretch last year, racking up 9.5 sacks in the final six games. He remains a stout run defender to boot. Battling injuries of his own -- as well as accusations of being out of shape -- Woodley's production has tailed off the past two years. From 2008 to 2011, though, he was one of the NFL's most productive pass rushers. The Raiders believe the former Steeler is better suited to Dennis Allen's 4-3 defense. Among the league's most versatile linemen, Smith started 78 of 80 games for the Texans over the past five seasons, spending time at end and tackle. The Raiders roster still is woefully short on talented young "foundation" players, but Reggie McKenzie has at least made his team competitive entering his third season as general manager.